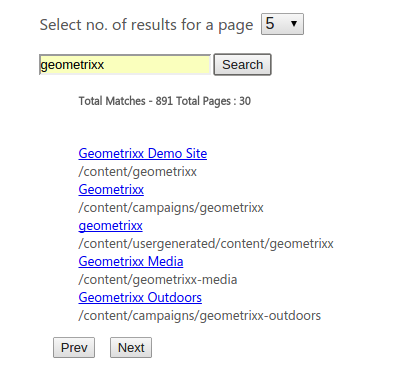 The full-text field search allows you to look for a field anywhere in a webpage, be it the title, content, or the url of a webpage. A full-text search shall match whole words. For example, a full-text search on comments that contains “perform search” or “text search” or “text” will return a comment that contains “I want to perform text search in AEM”. To implement the same in AEM6, I have used QueryBuilder API which is a service for building Queries for searching the Java Content Repository and are easily extensible. Populate in a map all the predicates with the values. now use Query interface to create a query object that will in turn use builder object of Query Builder interface to build the query. searchResult will contain the result of the JCR query. A hit represents a single search result which is adapted to a page so as to fetch the page title and page url for display. This much should be sufficient to design a working Site Search component in AEM that performs fulltext Search and displays paginated results. I will introduce advanced fulltext queries in my forthcoming post. Hi,I have just started working on AEM6.3, I need to call an API to power the search. Is there a complete doc to do that. I need to make it autocomplete as well how can i do tht?